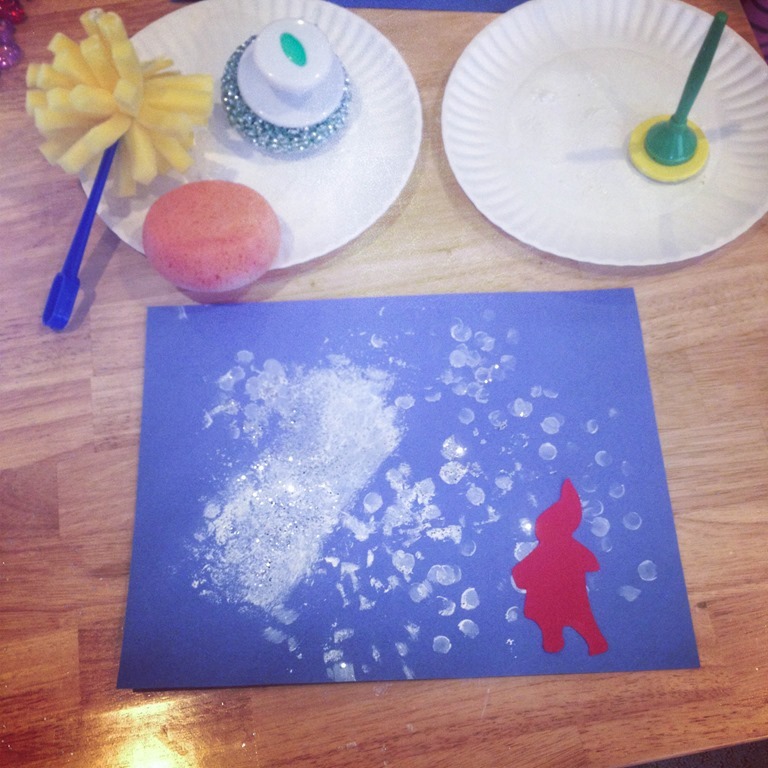 In between all of our letter fun, we have been playing with lots of snowy items or making wintry art in the classroom. 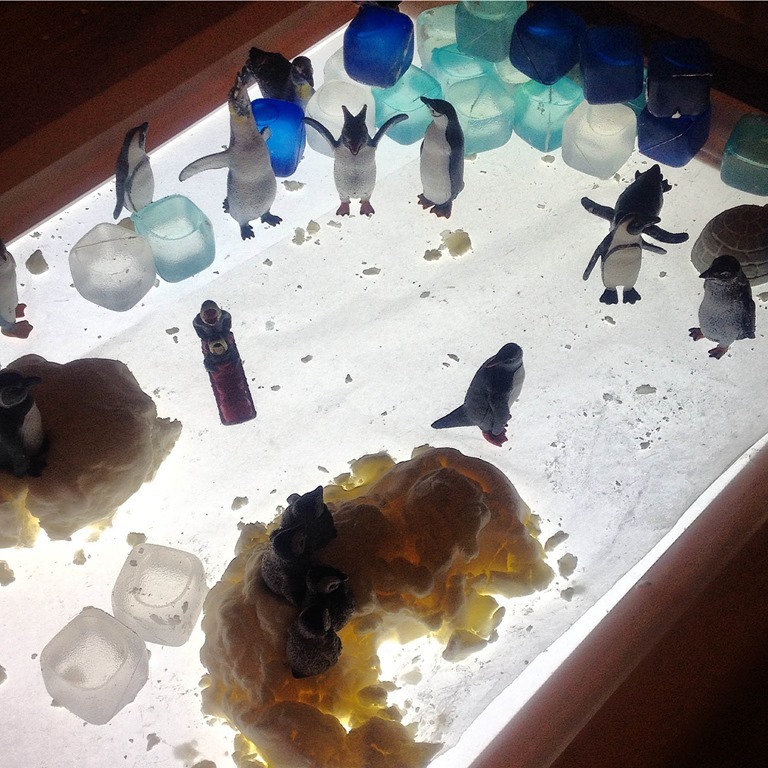 I started a little penguin exploration on the light table. 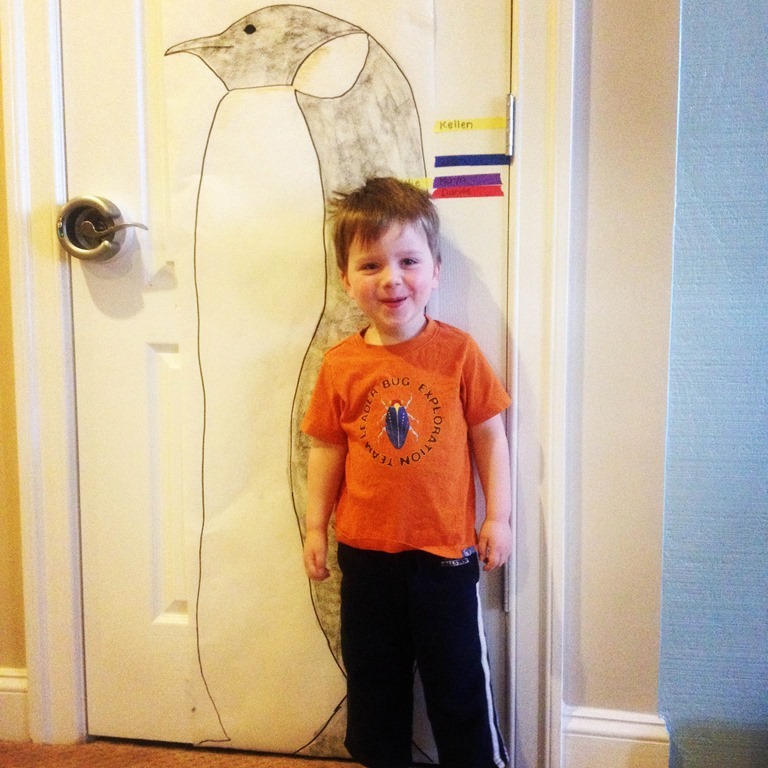 We talked a lot about penguins last year, their habits, and types of penguins. 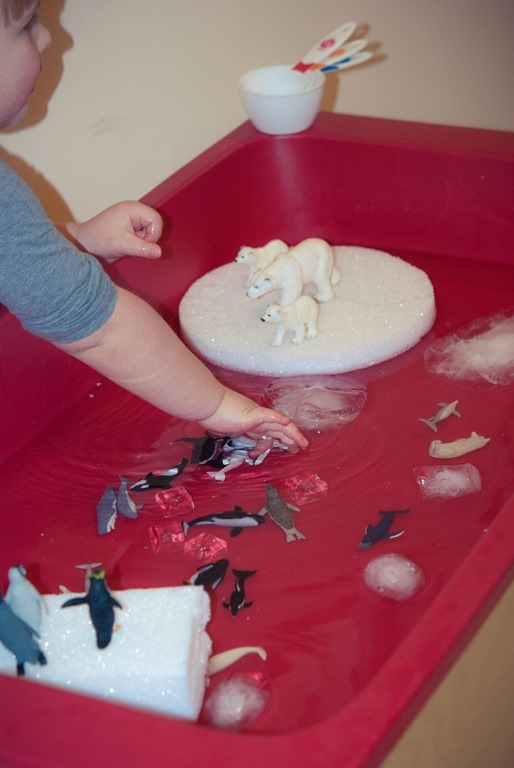 They are always such a fun animal for children to use in imaginative play. 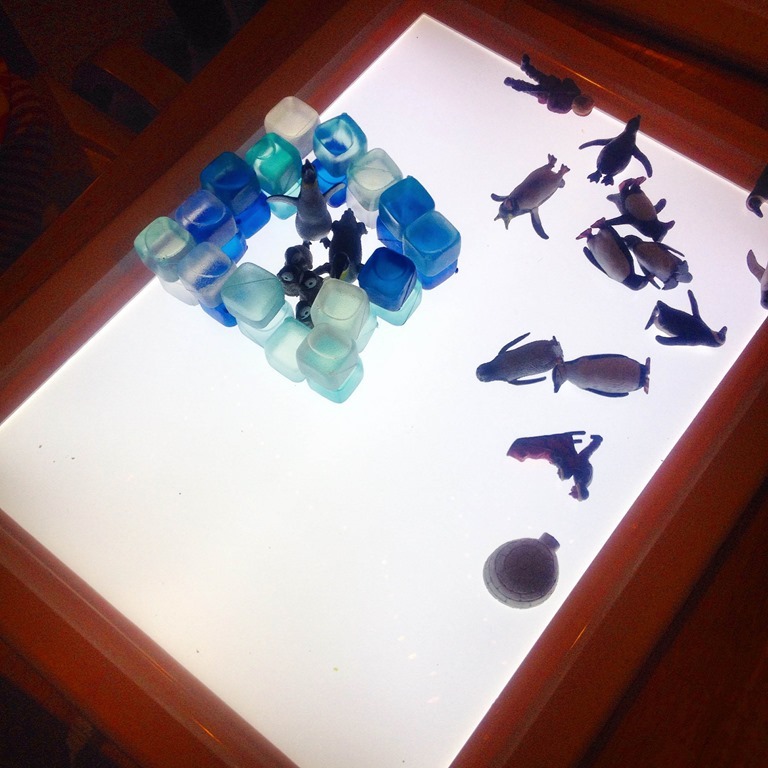 I place the penguins on the light table with shades of blue ice cubes. 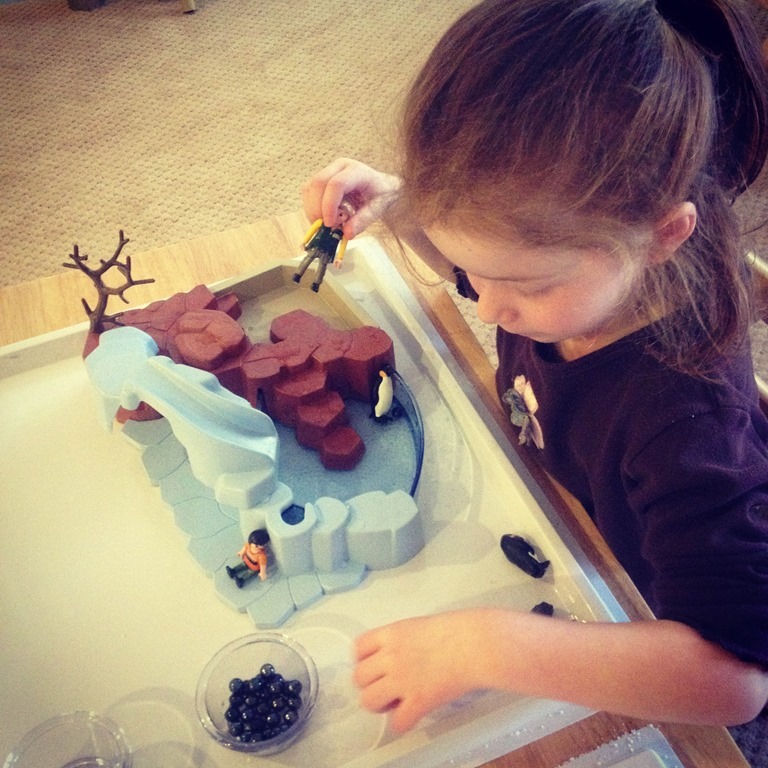 They made little houses and igloos and homes for the penguins. 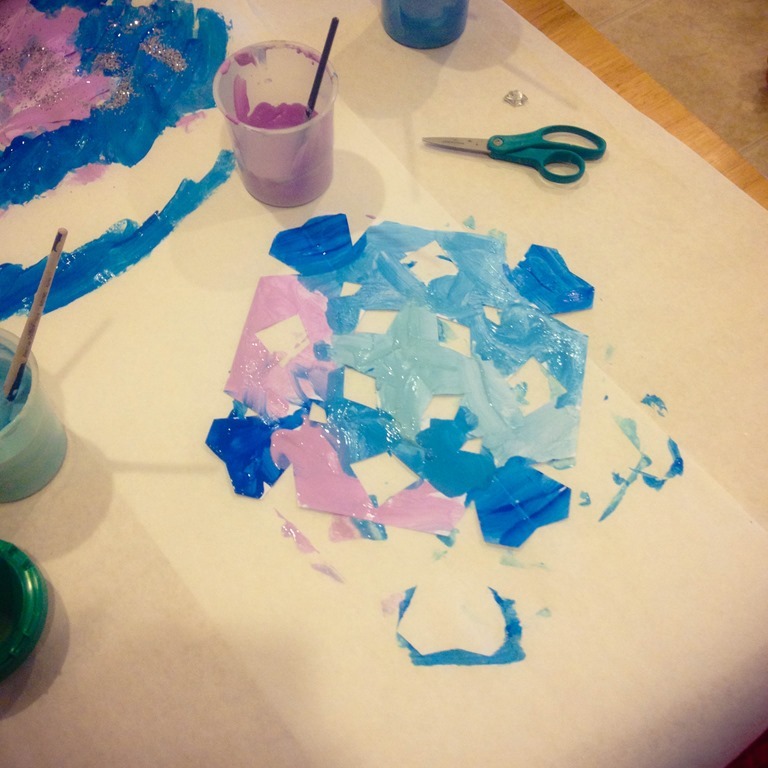 The following week I made a batch of snow dough using cornstarch and hair conditioner. It is soft flaky dough, and the children really seemed to enjoy it. It doesn’t bode well for cookie cutters, but it is perfect for shaping and squishing little penguin down inside of it. 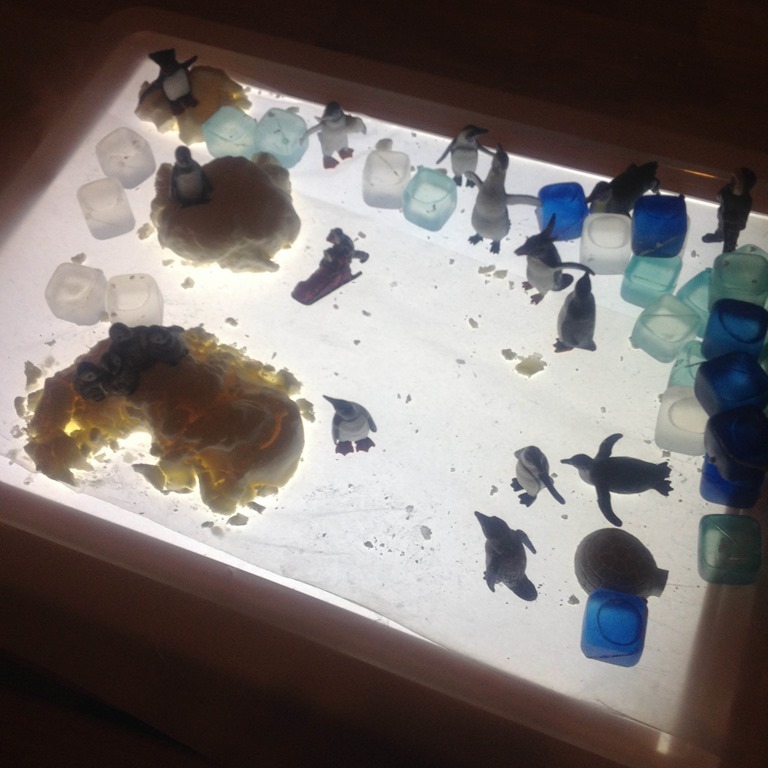 I placed the dough and some wax paper on the light table to extend their interest in the penguins. 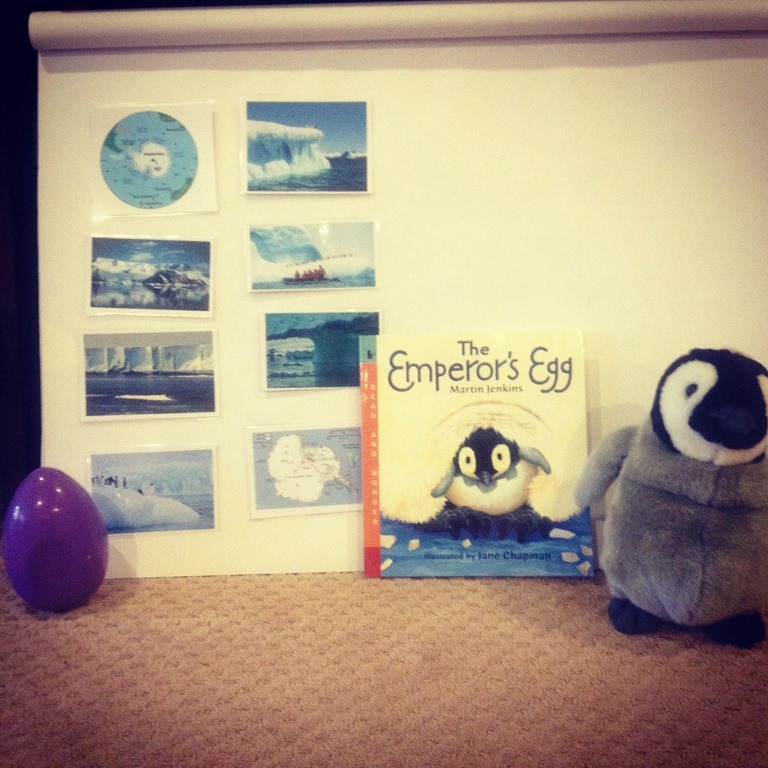 These are just a few of the photos of the different penguin set ups the children made. 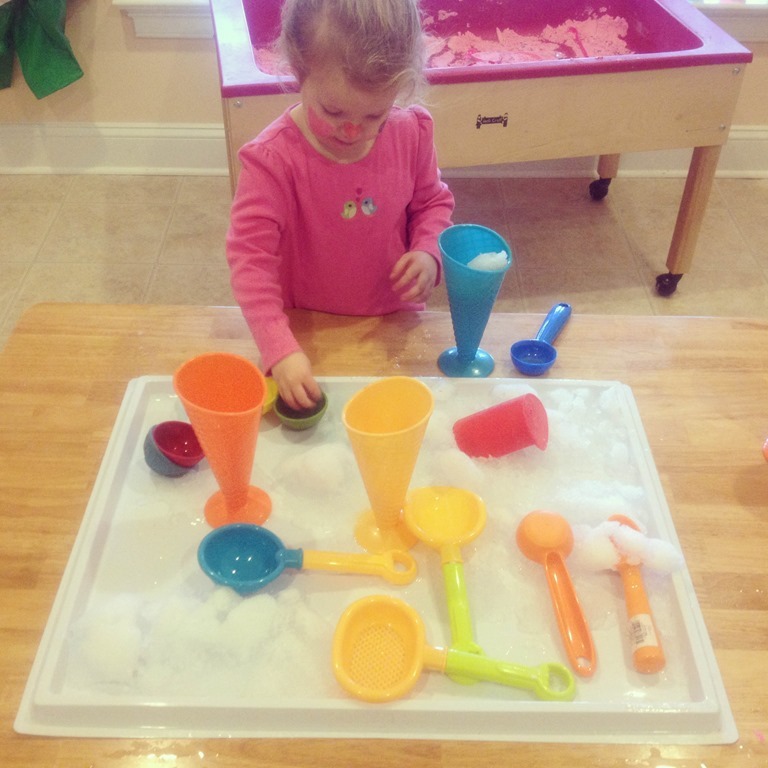 I thought it would be fun to juxtapose our snowy activities with some sand in the sensory tables. 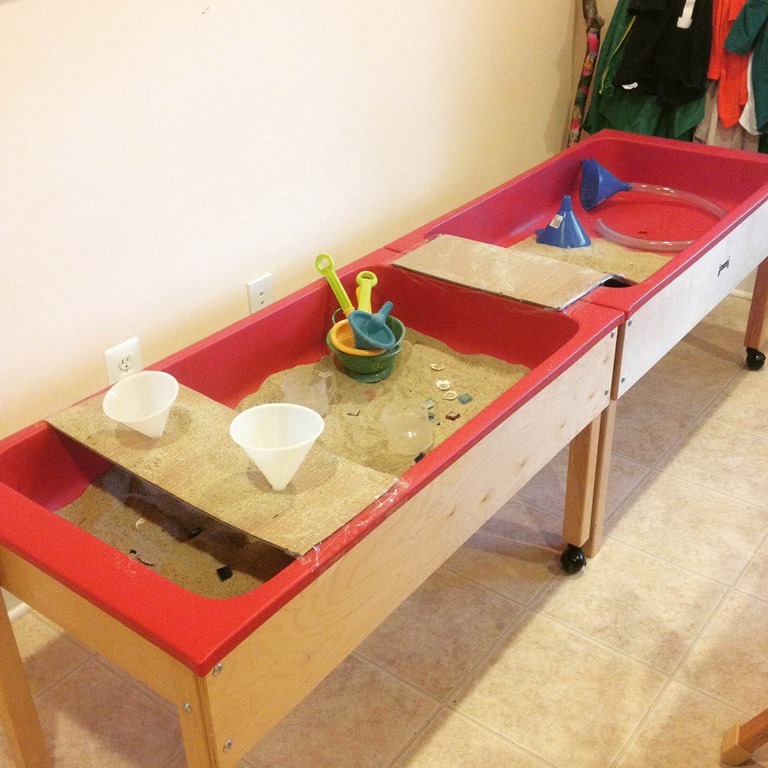 It has been a long time since our sand box was opened up too! I pulled both of the tables together to make a sand slide to connect them. I also added a funnel holder by cutting apart a box to make a ledge and shoving the funnels down inside. 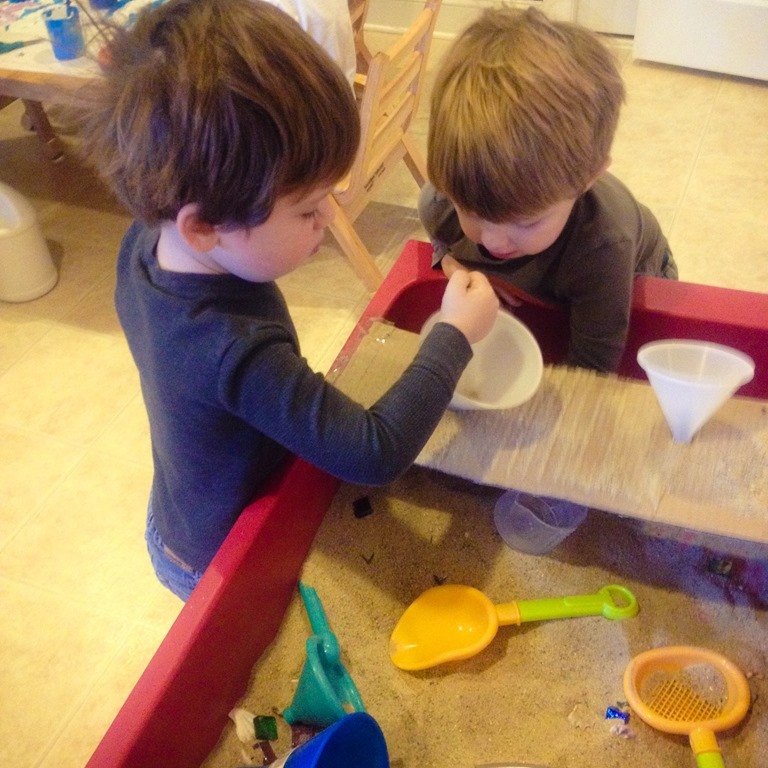 They enjoyed the funnels the most, and loved to watch the sand fill up under the funnels. 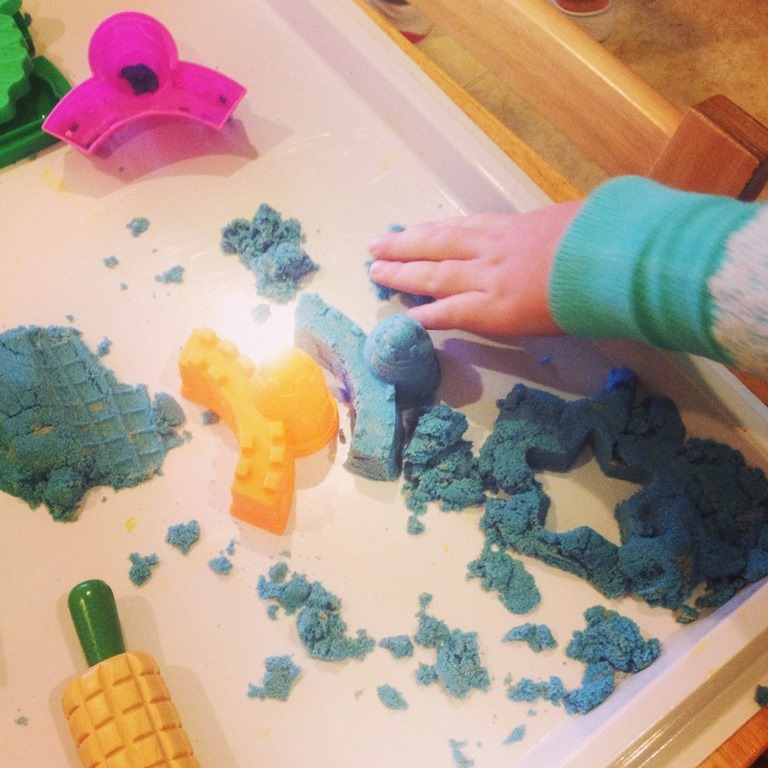 Next to the sand tables I laid out something new on the art tables….Kinetic sand! 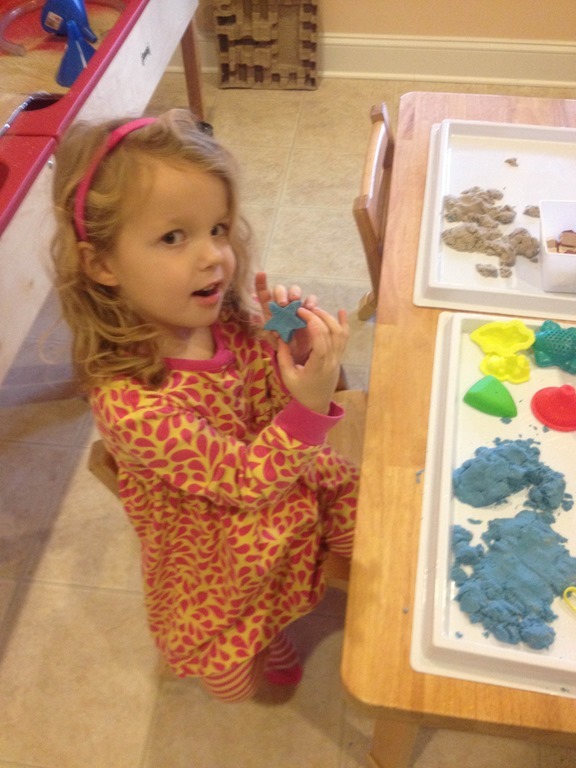 It is a very thick sand that is moldable, squishy, and just plain fun to get your hands on! I also discovered these tiny castle molds at the craft store that were perfect for the kinetic sand. This is how many of the children have spent their mornings in January. 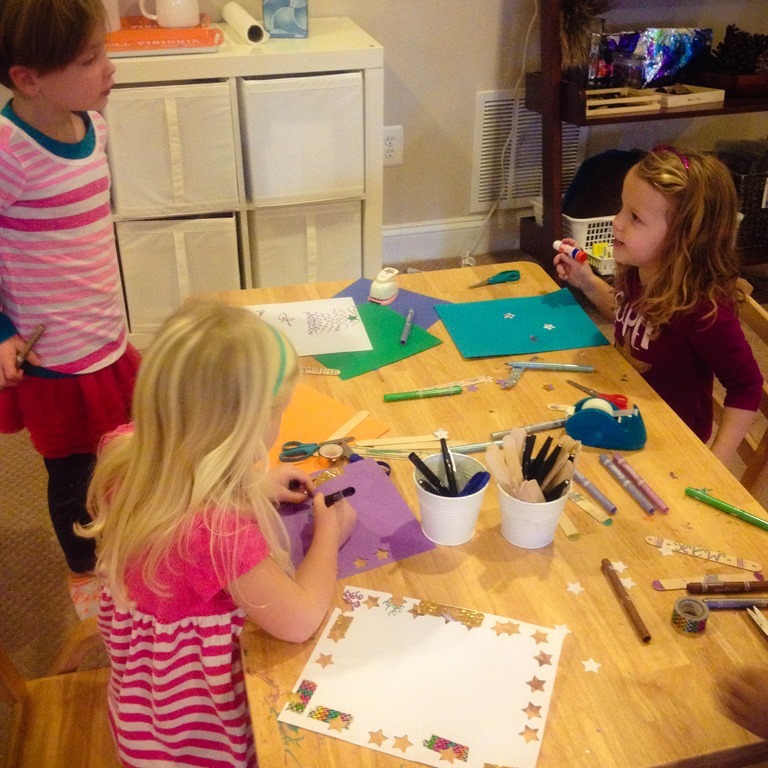 They have been collecting all of the paper supplies they can find and punching, coloring, cutting, taping, and making lots and lots of things for each other and their homes. 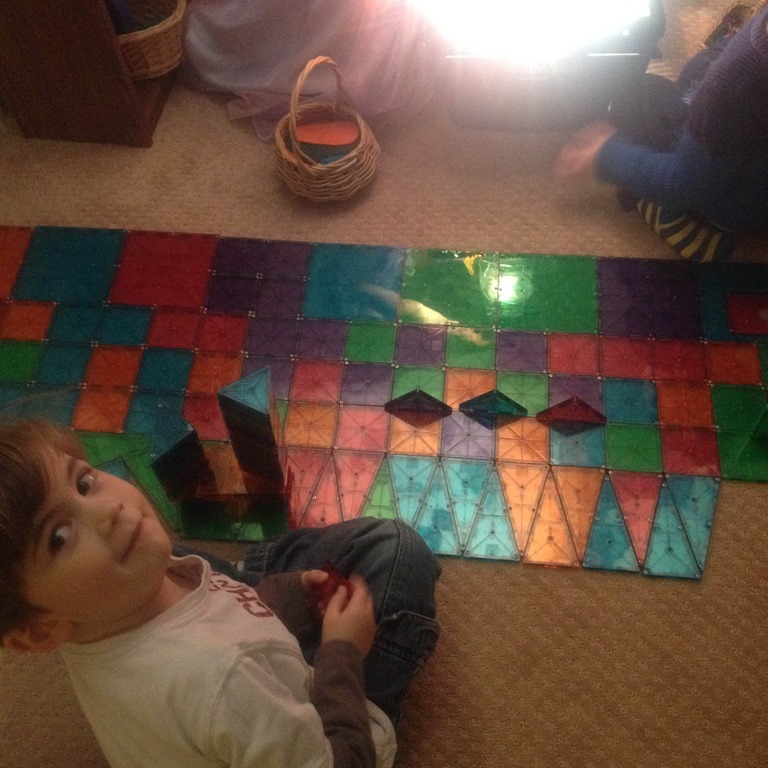 I love giving them a variety of materials and seeing what they come up with! Their play sure is evolving right before our eyes! 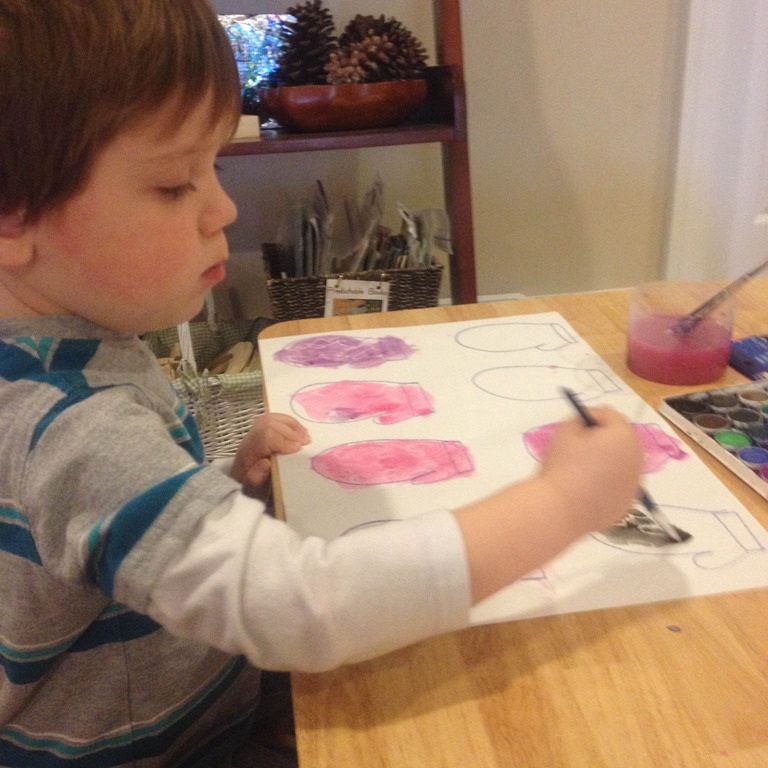 The children uncovered some patterned mittens with our watercolors. 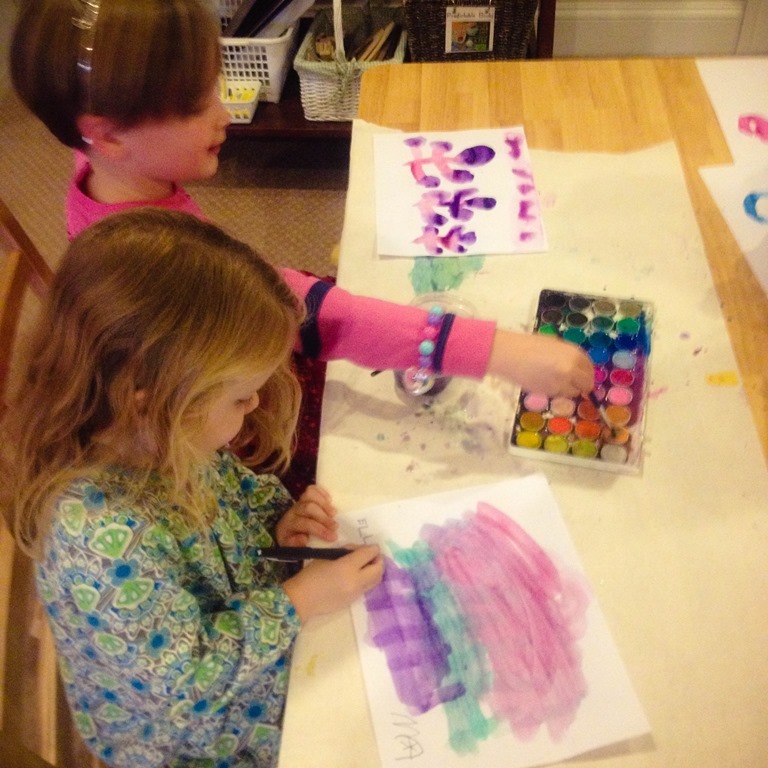 Then the watercolors were used for creating our own photos. 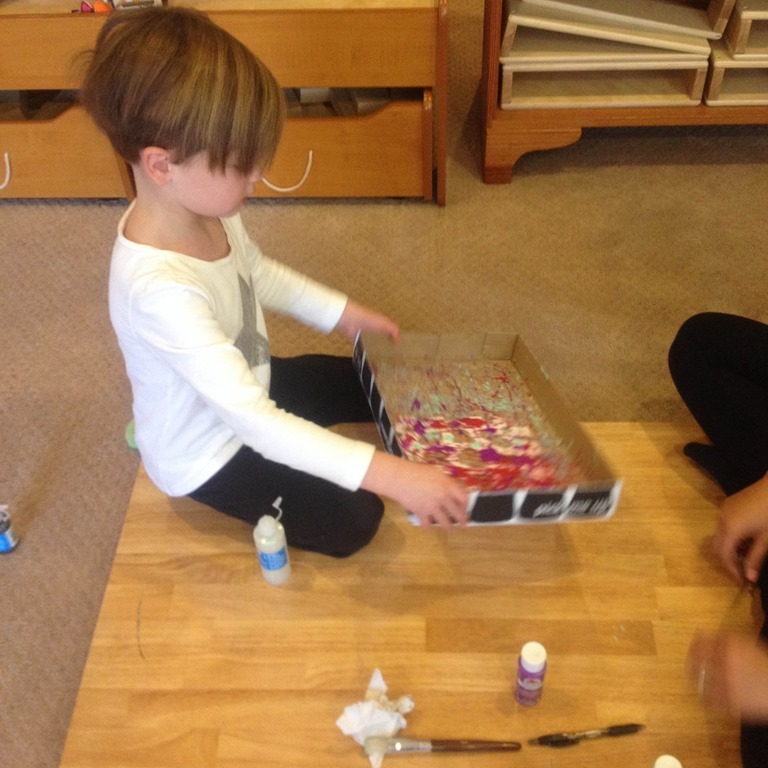 We dripped acrylic paints inside of a box filled with marbles. 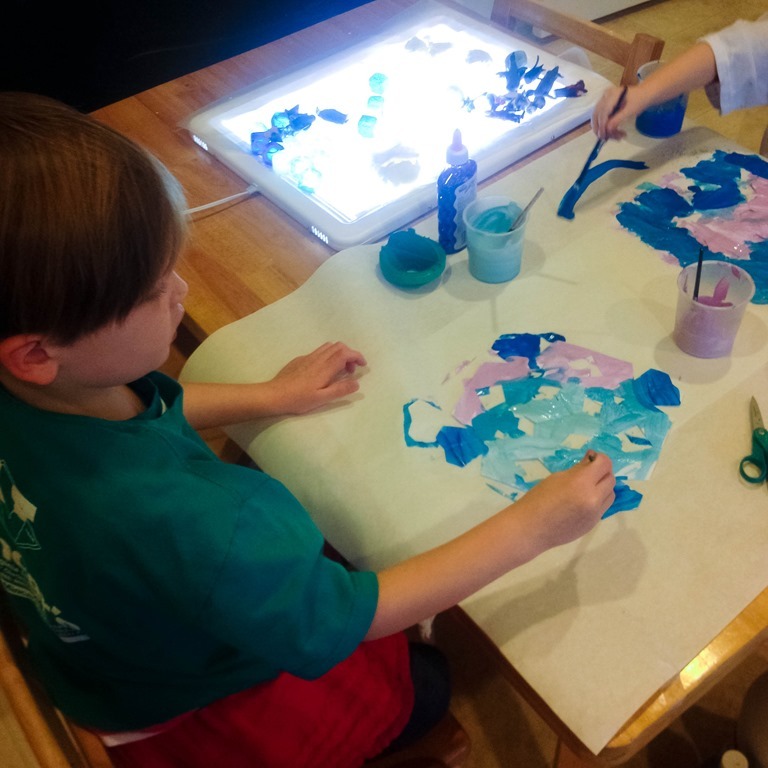 Then we got busy rolling them around to create some beautiful snowflakes. 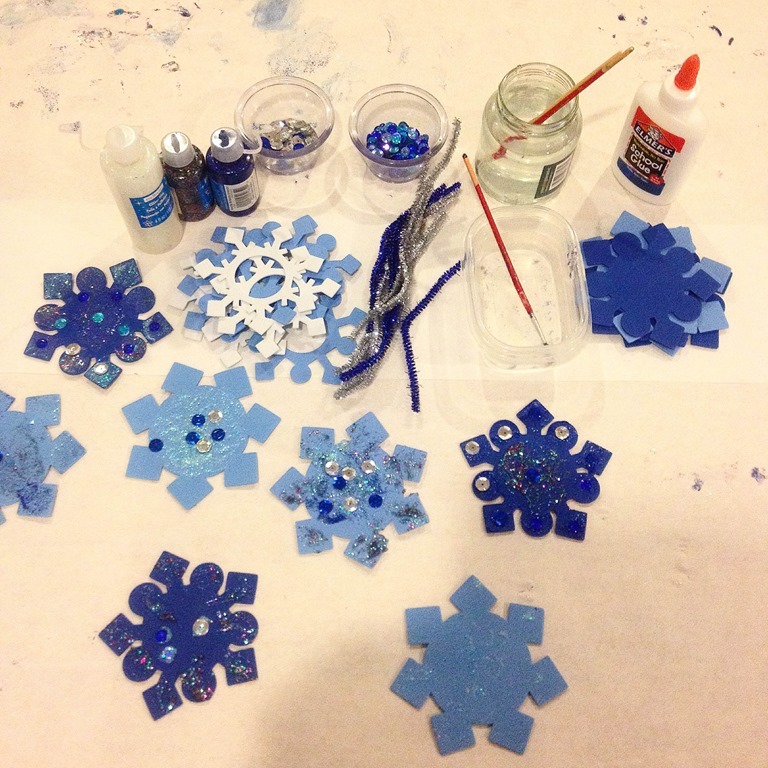 I put some different snowflake materials on the table one morning, and they got busy making lots and lots of snowflakes. 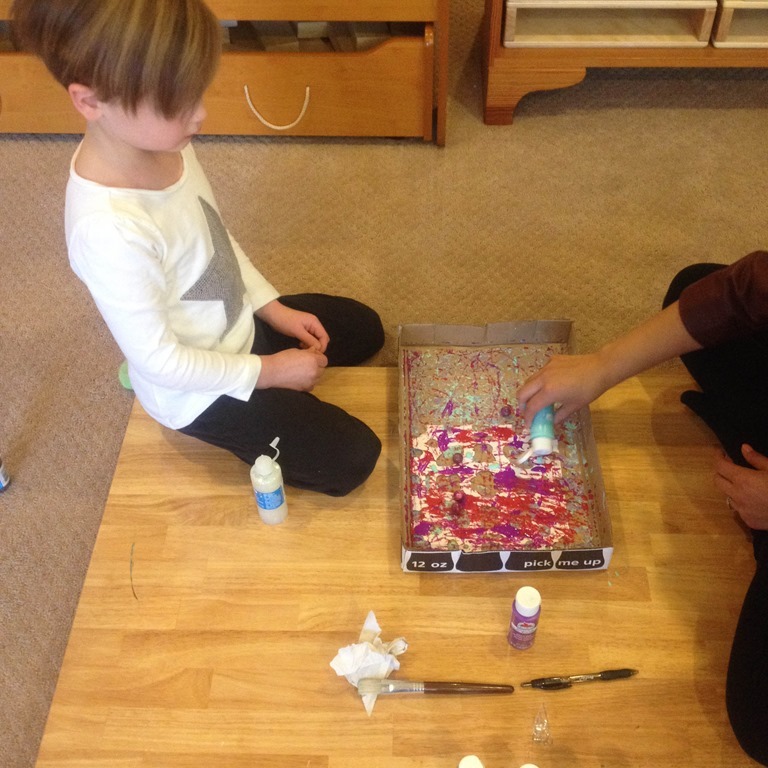 The biggest hit was the squeezable glitter glue! I finally purchased a giant container of white paint. 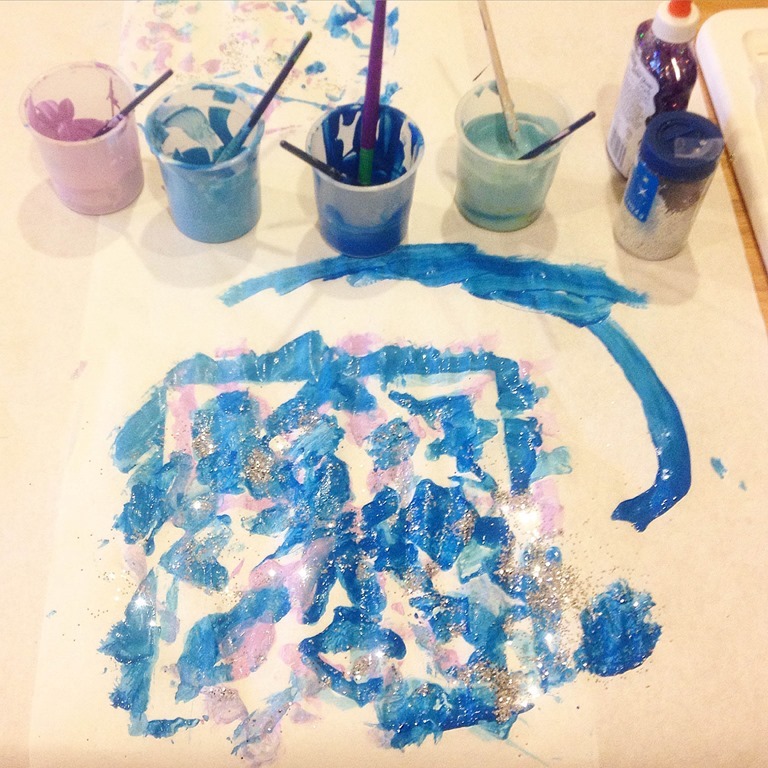 I added white paint to different shades of blue and purple, to create this lovely paint invitation. 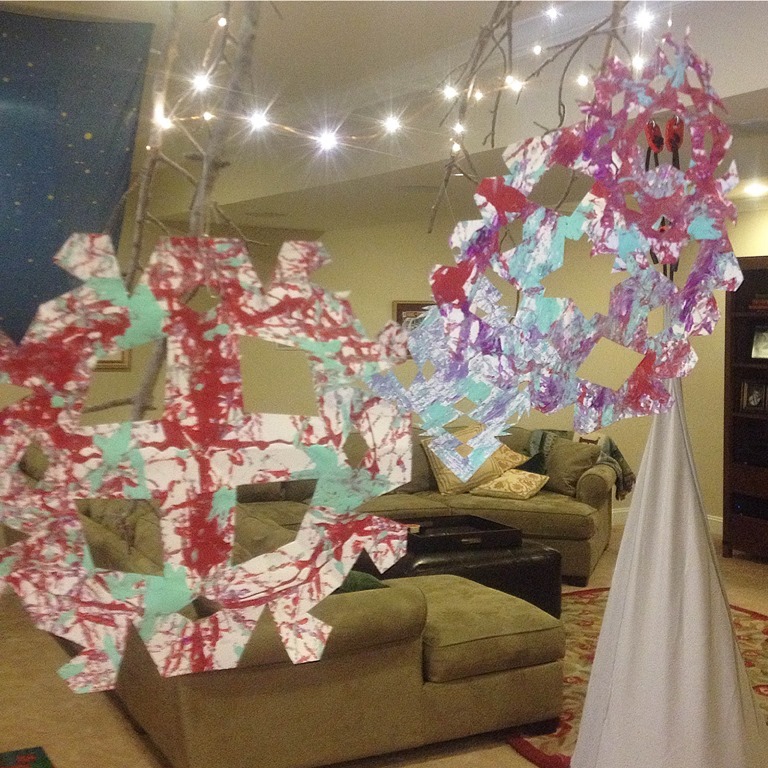 They painted the remainder of Brittany’s snowflakes and poured some glitter on top for good measure. 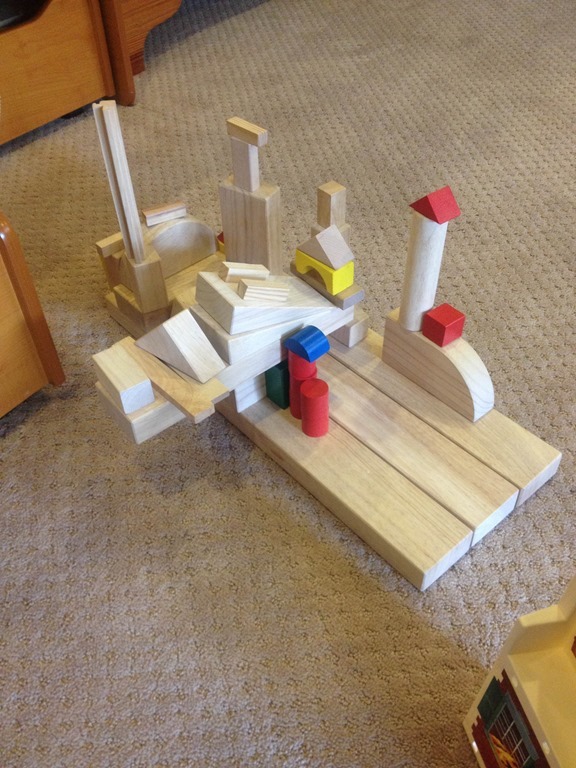 Block play continues to be a vital part of our morning play time. 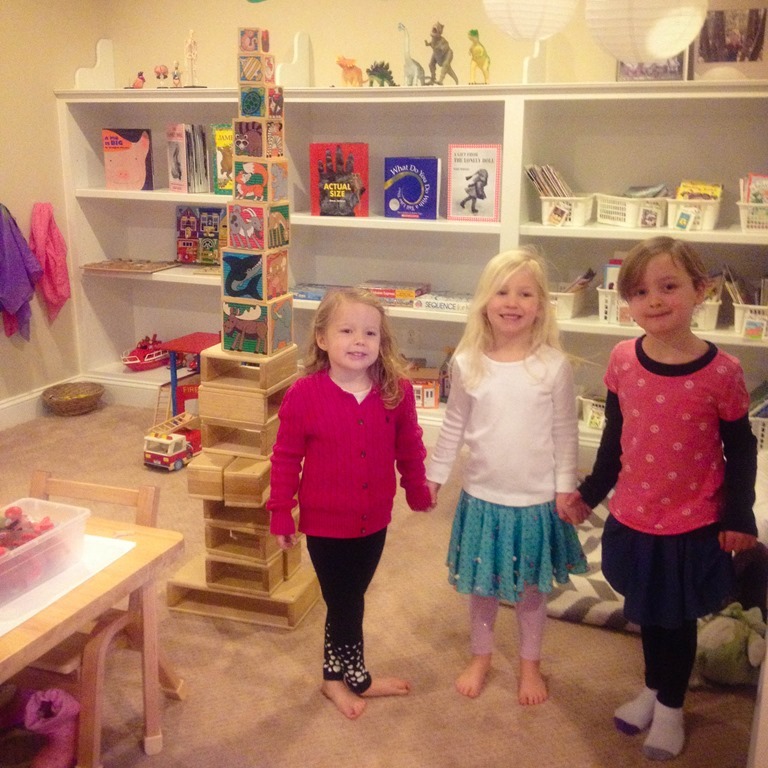 These three buddies were proud of this enormous tower they put together using all sorts of blocks and chairs for standing on their tippy toes. 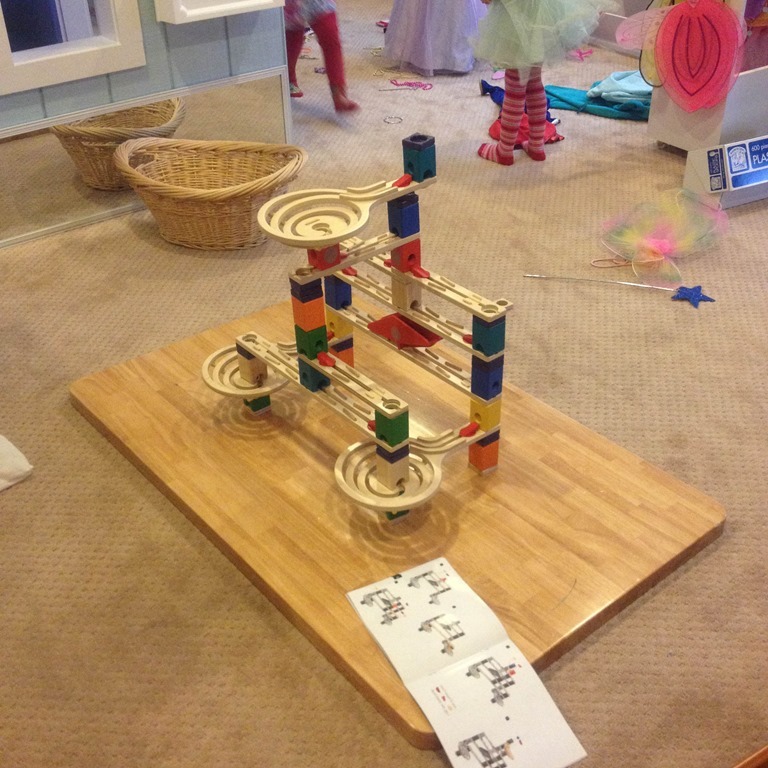 We have continued to explore our marble run and make new marble paths to explore. 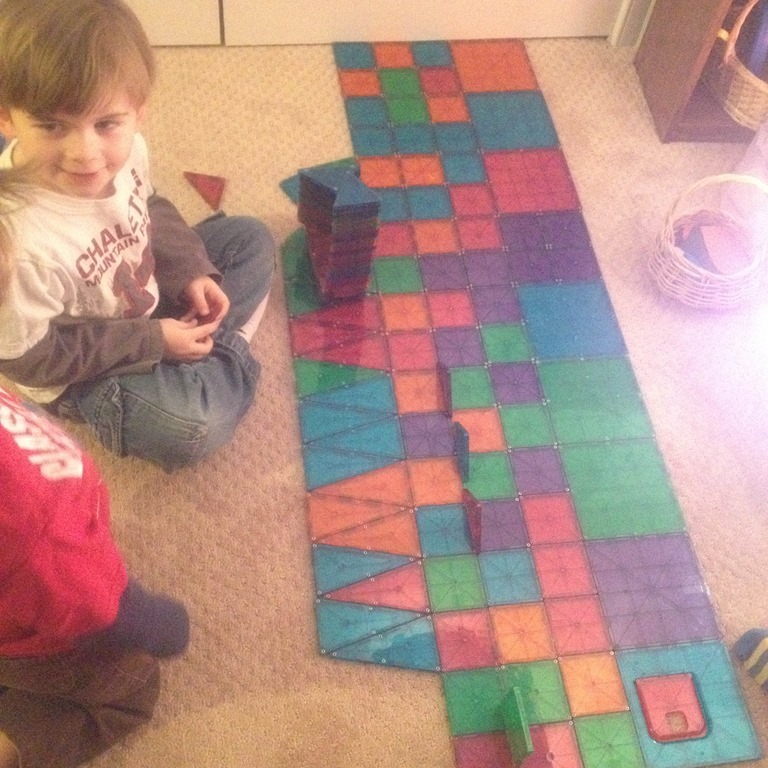 D built this unique block house with a mixture of our unit blocks and smaller block pieces. 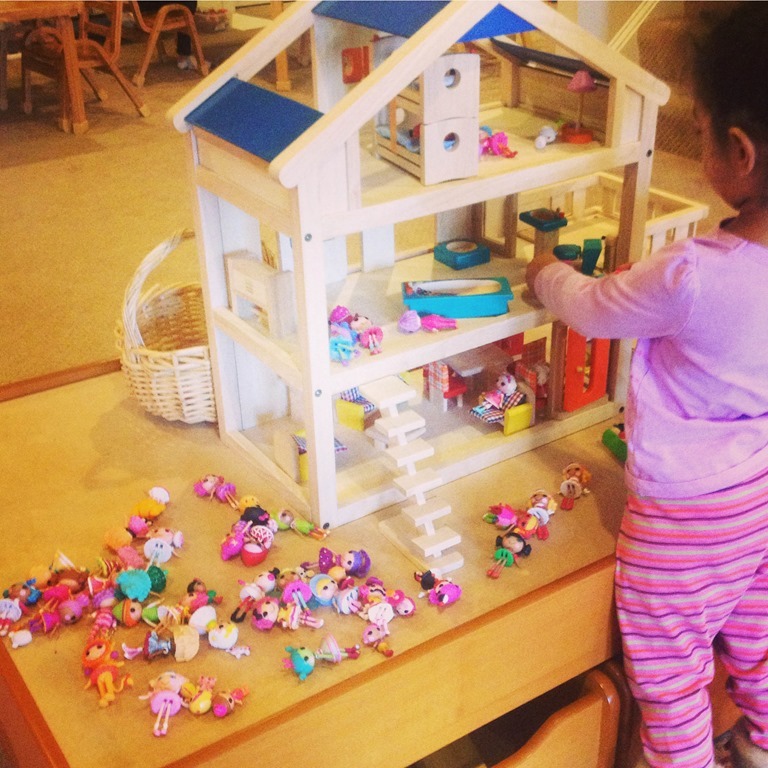 Our new dollhouse was untouched the first week back to school, but then I added some Lalaloopsys to the table and it was soon a popular spot in the room. 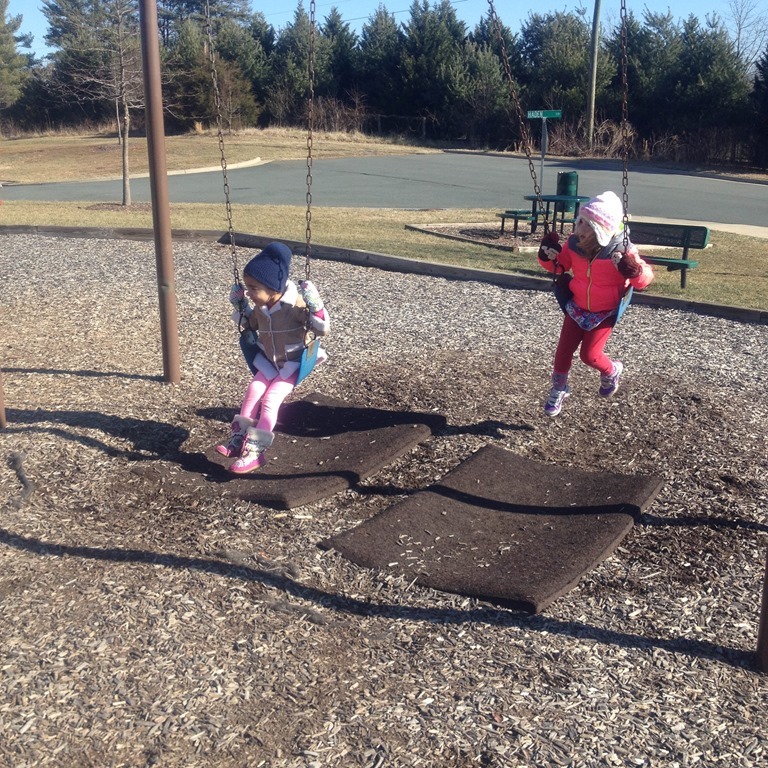 Even in the coldest of weather we continue to go outside everyday. We usually stick to a brisk walk if the weather is really cold and windy. 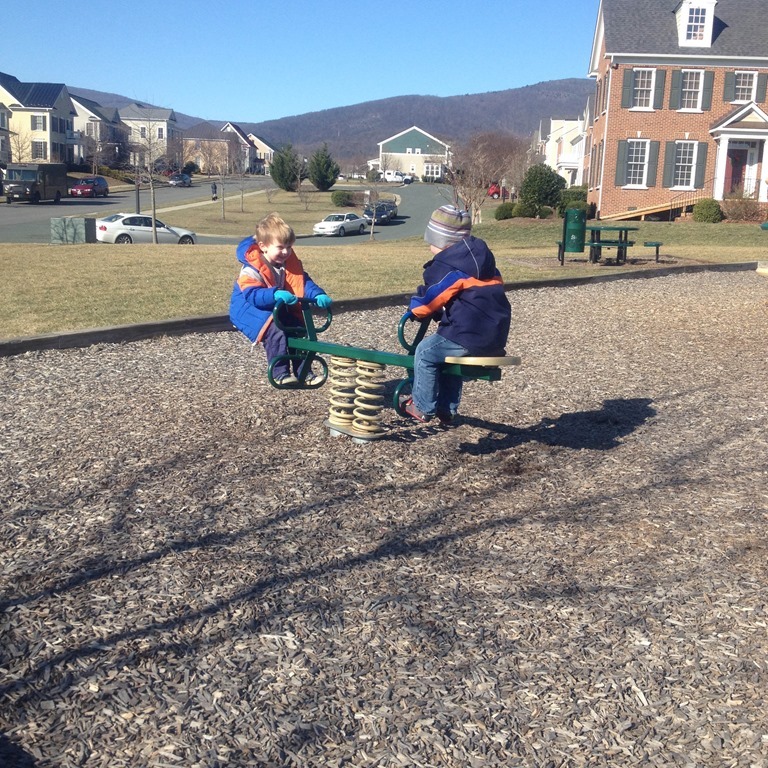 But, one morning we had a break from the cold and made our way to the play ground. What a treat!! 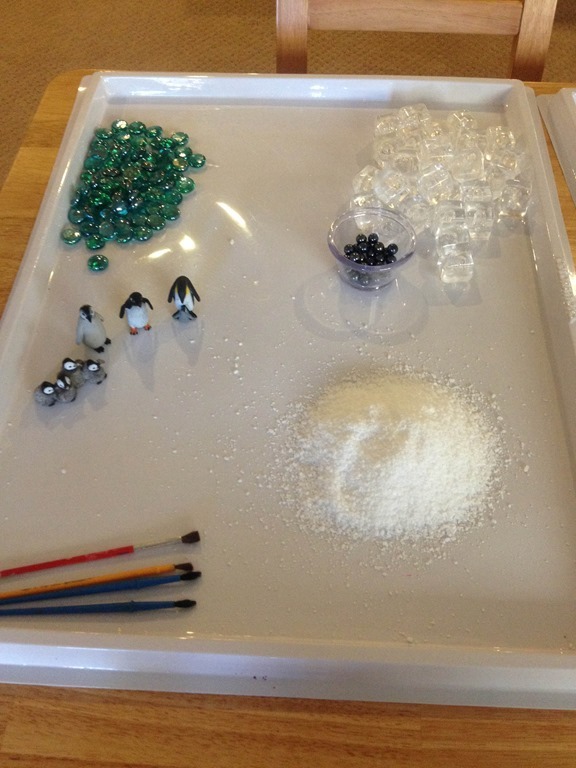 Categories: preschool, reggio emilia inspired | Tags: block play, magnatiles, play based preschool, process art, sensory play, sensory tables, snow, snowflakes, winter, winter crafts | Permalink. The Snowy Day or should I say Snowy Days…. We have missed a lot of school this year due to ice, snow, or a combination of the two! 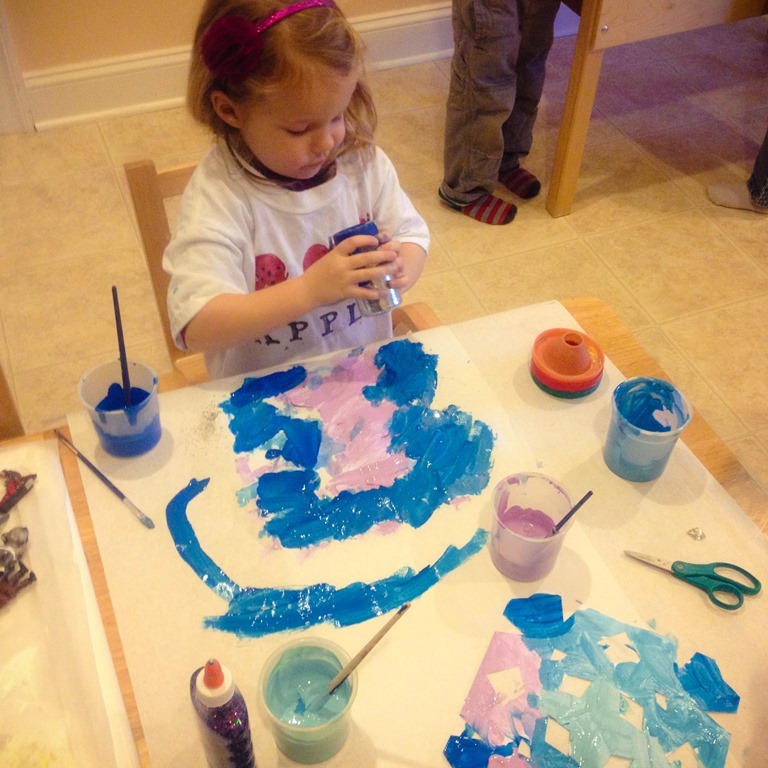 I decided to embrace all of this winter weather by doing a few more snowy and icy activities mixed in our Valentine’s Day fun. 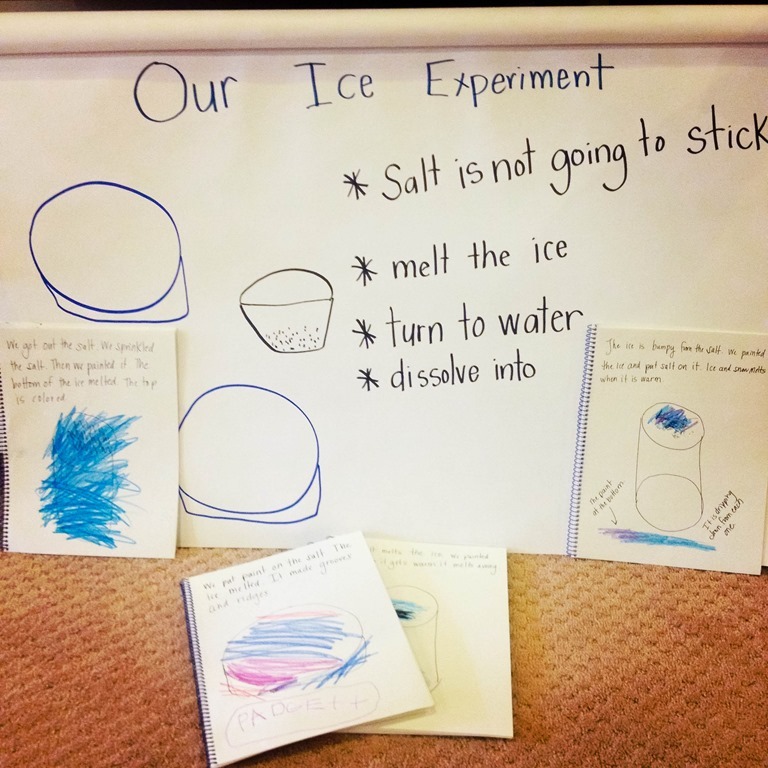 The first science experiment we did was an Ice Experiment. 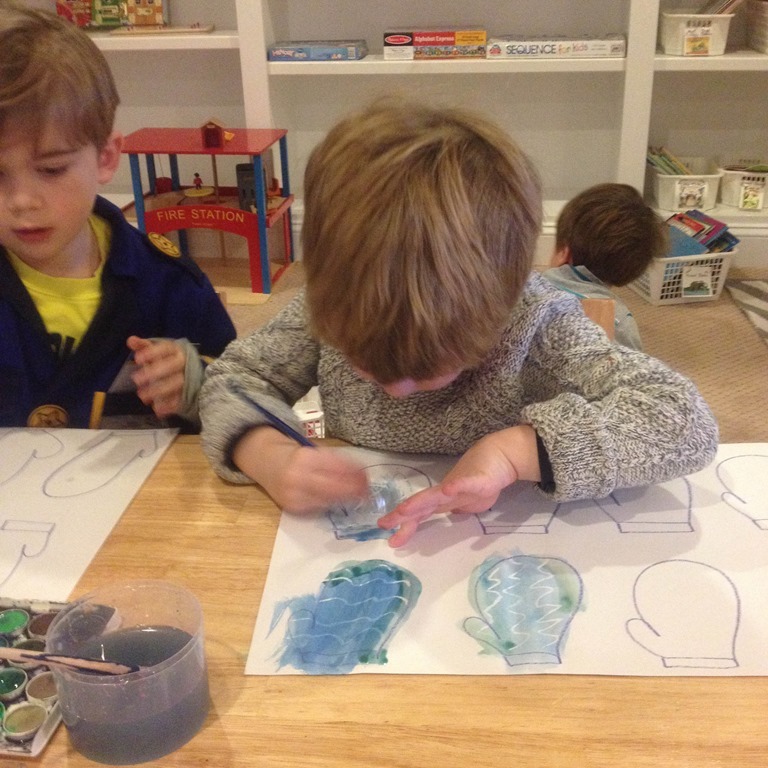 We started by talking about ice and what happens to it when it starts to warm up. We also discussed all of the plow and snow trucks and why they sprinkle salt on our roads. The M/W/F group also put their learning down on paper. In the picture above of our hypothesis there are all of the learning journals from the students. 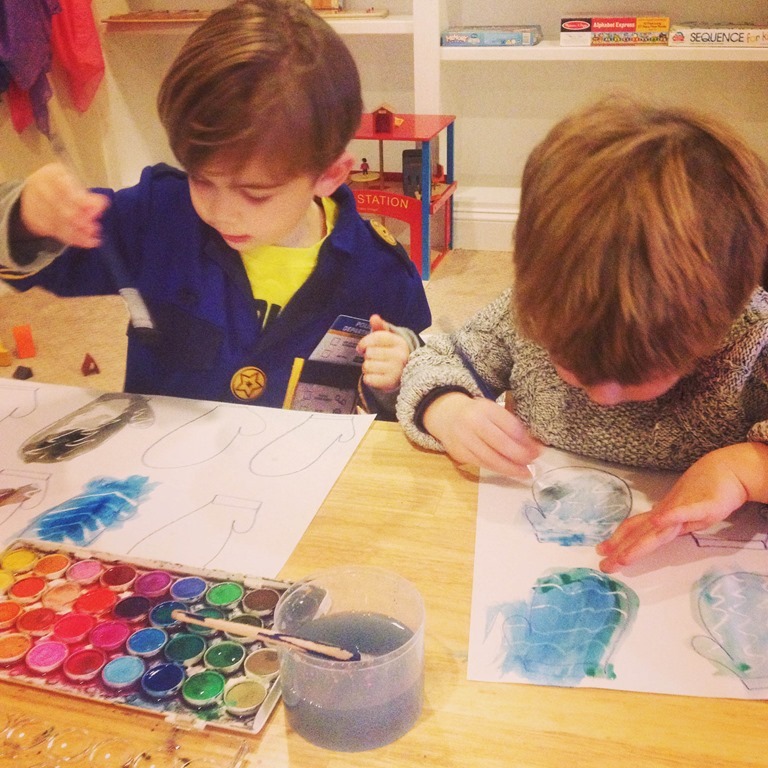 I drew the shapes of the ice for them, and they drew the colors and spots of the cracks in the ice. I recorded their thoughts in their journal too. After that great discussion we got to work! 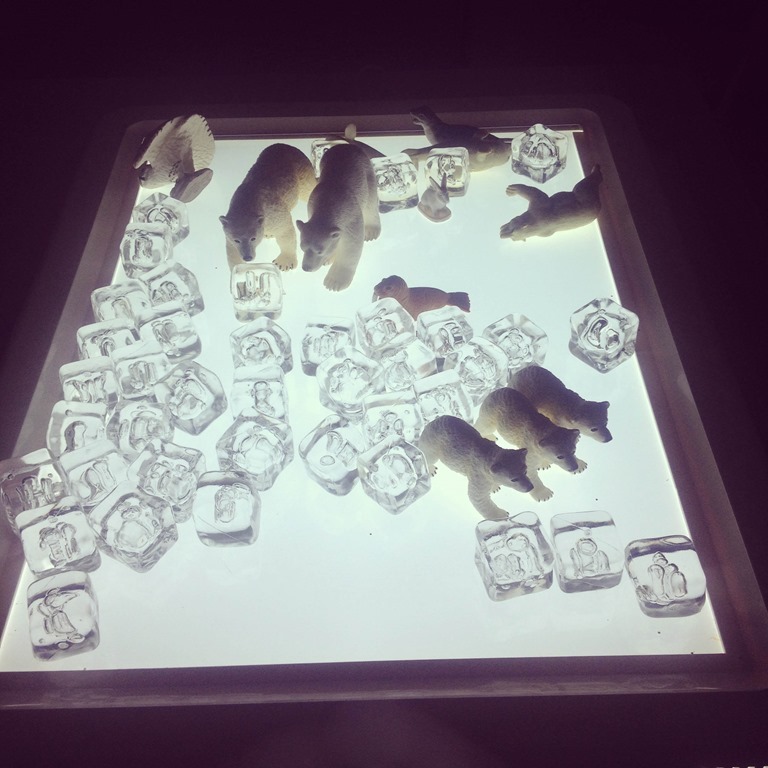 I set up our station with three different ice blocks, cups of salt, water colors and pipettes. Both groups thoroughly enjoyed this activity. 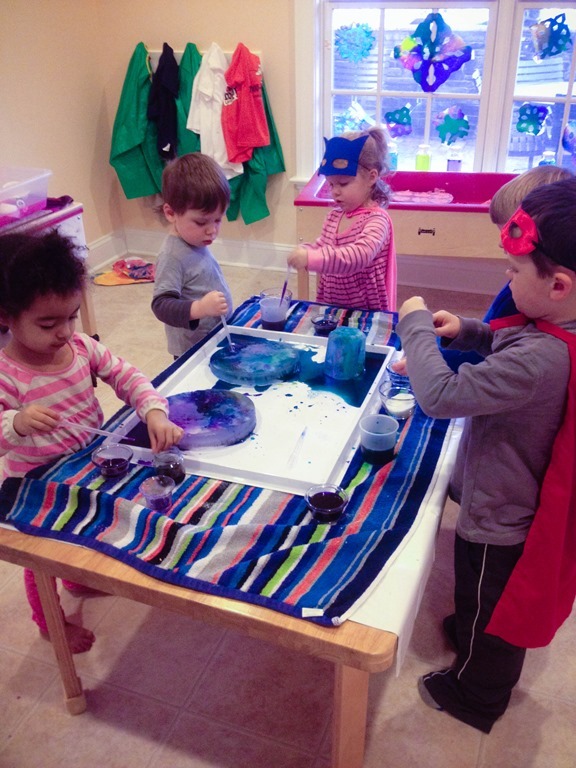 I am always pleasantly surprised when you present children with engaging “invitations” the amount of time they will spend exploring, talking, and playing in them. 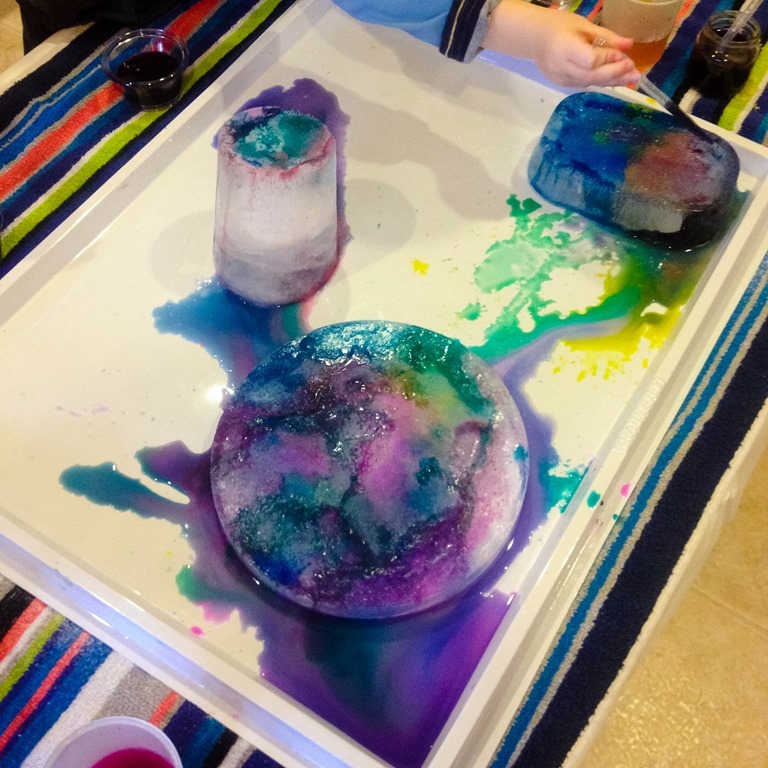 The T/TH group below actually made their ice crack open quickly because they spent a lot of time pouring salt on their ice. They asked me for salt refills a number of times. 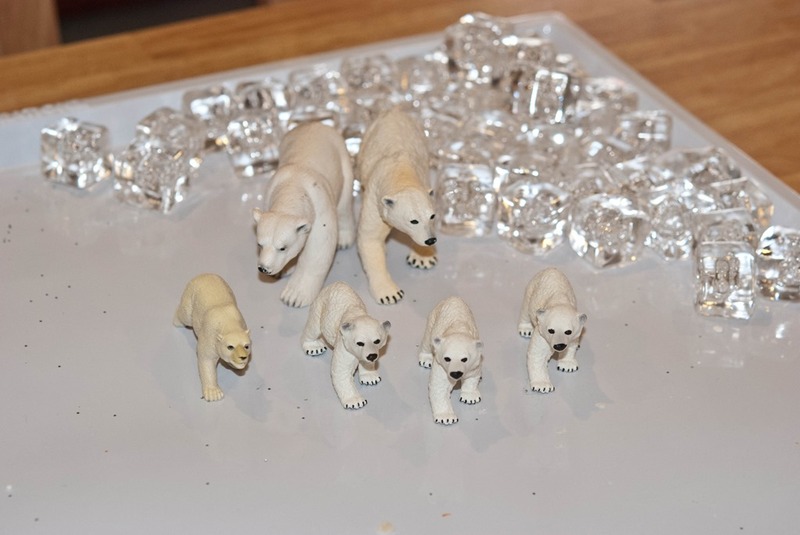 After they salted and painted their ice over and over again we carried the ice blocks outside in the snow. We looked through the ice and studied the grooves and cracks the salt created. Once the ice was dumped outside the last step was stomping on the ice to break it down into small bits. One morning after snow I created a snow ice cream station for the kids. I pulled out the scoops and ice cream dishes I found at the dollar store, and scooped some snow onto a large tray. They spent a ton of time making snow ice cream for each other. I am somewhat of a Pinterest fanatic. I use it for almost all of my planning and a way to organize my ideas for school. 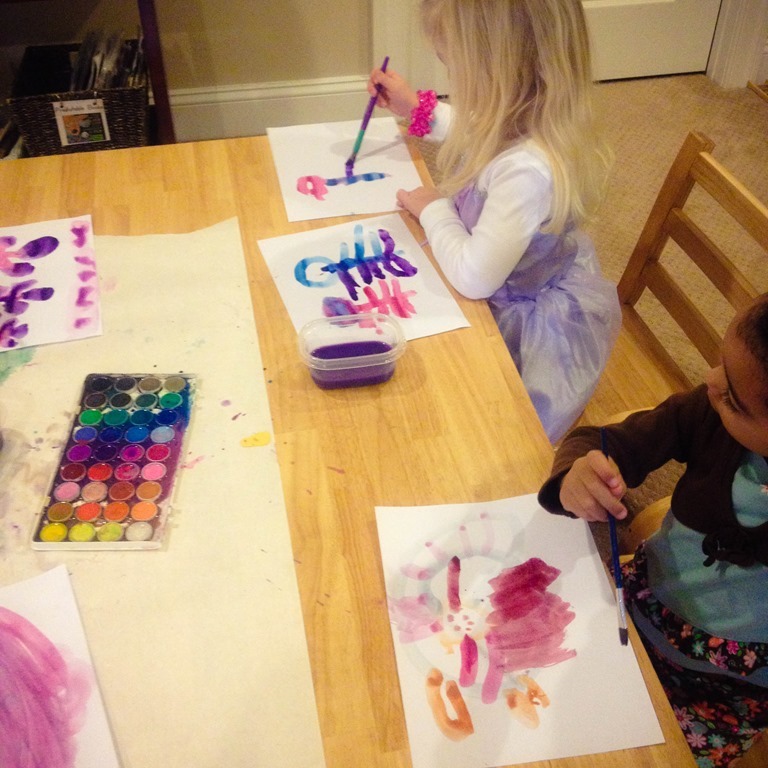 You can follow me on Pinterest here if you are looking for fun things to do with your kids. Even if you aren’t on Pinterest you can still flip through my boards to see lots and lots of goodies. 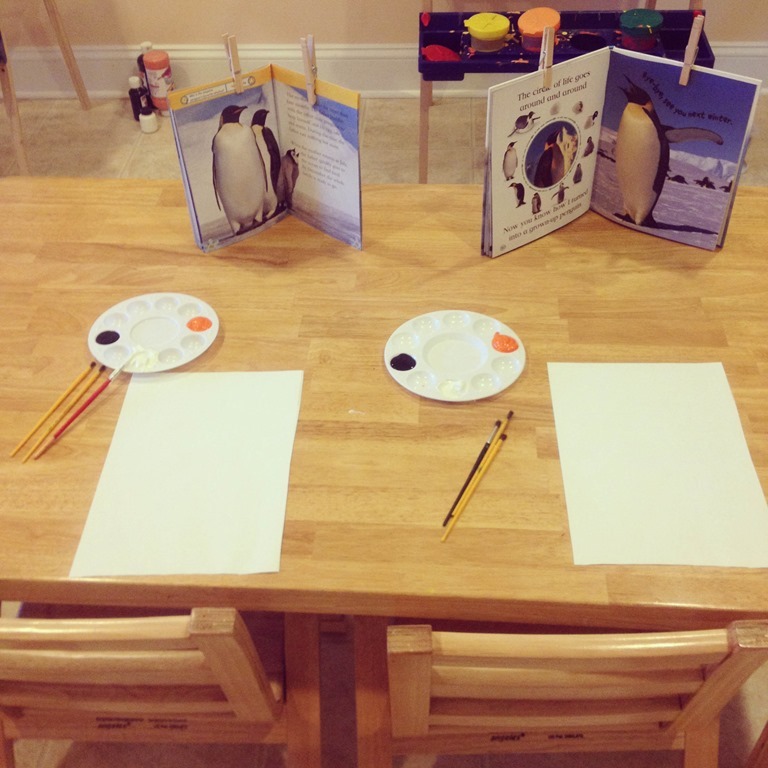 I found this art idea on Pinterest for The Snowy Day under my Winter Wonder board. 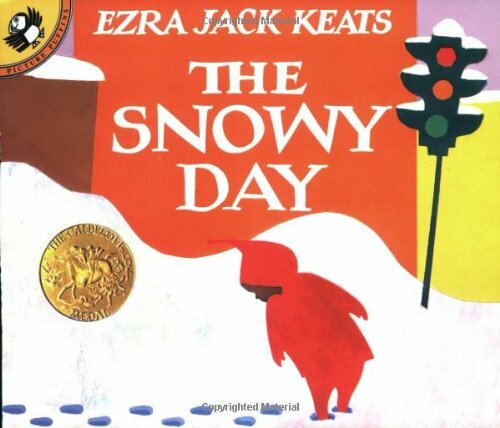 The Snowy Day by Ezra Jack Keats is a famous children’s book and a Caldecott Winner. If you click on the title it will direct to amazon.com to purchase the book. In the book Peter sets off to explore the new fallen snow. When he returns home he wants to save some of the snow, so he packs it into a snowball and puts it in his pocket for later. He is sad when he later looks inside his jacket to find the snowball is gone. As you can see this was the perfect book to read to go along with our “snowy” theme! 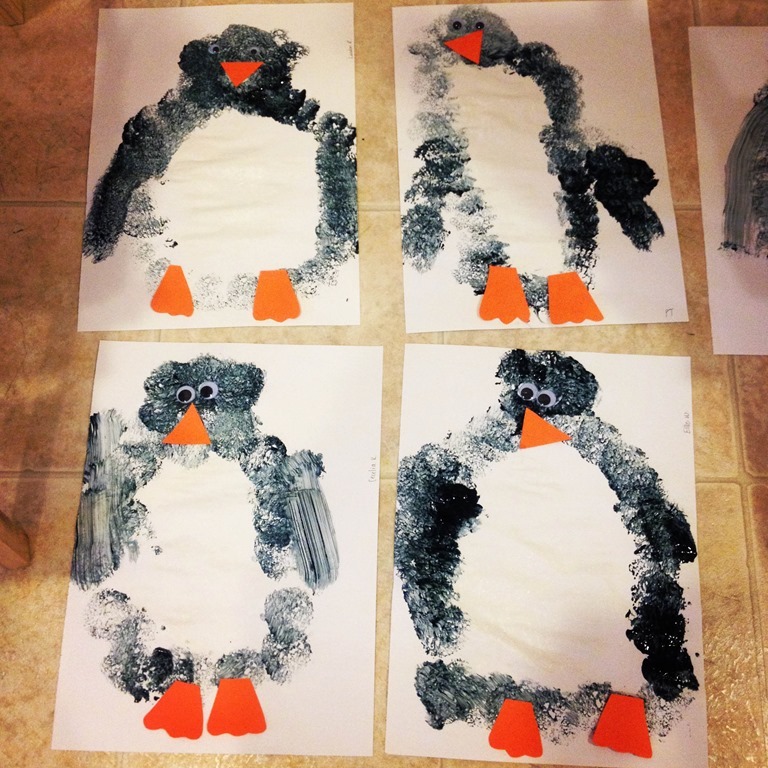 After we read the book children got to use a variety of paint brushes and sponges to make snow on their art work. Then they glued an outline of Peter onto their paper. 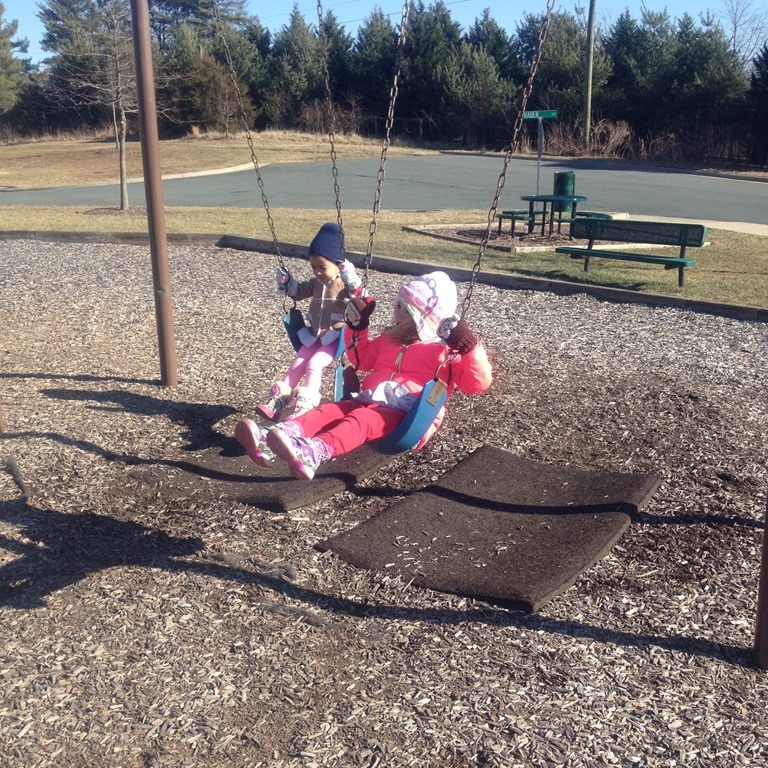 This was a great follow up activity to The Snowy Day. I hope we are at the end of all of our snow and ice adventures! I am ready to move on to all things spring! 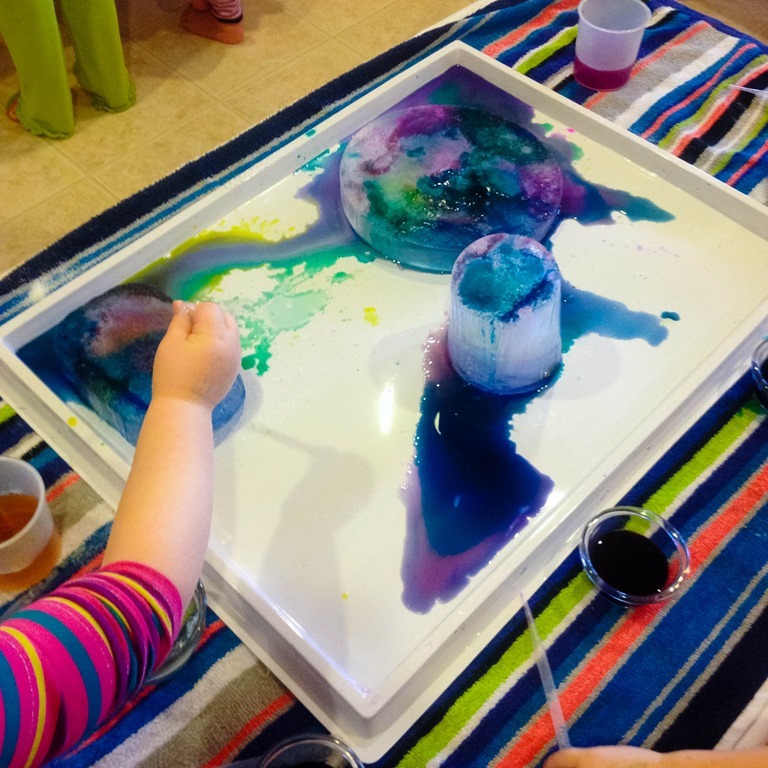 Categories: education, home based preschool, home preschool, play based learning, preschool, process art, sensory play | Tags: ice, preschool science, pretend play, science, science experiments, sensory bins, sensory play, snow, winter, winter books, winter crafts, winter read alouds, winter themes | Permalink.